A new breath sensor for testing ammonia could reduce the need for certain patients to take blood tests, including those with liver conditions such as cirrhosis and hepatitis. 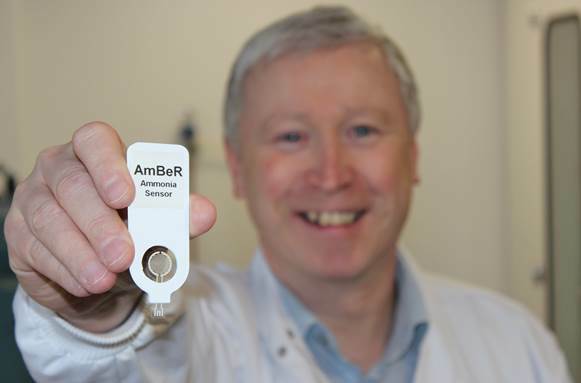 The device, known as AmBeR, was developed by Prof Tony Killard from the University of the West of England (UWE Bristol). It came about while he was investigating new nanotechnology sensor materials. AmBeR uses polyaniline, an electricity-conducting polymer that Killard formed into nanoparticles. He discovered that this made the material extremely sensitive, and it could also be deposited in layers just thousandths of a millimetre thick using low-cost printing technology. According to Killard, the device could have a significant impact for those who need to test regularly for ammonia levels. The technology will deliver pain-free testing with greater accuracy than many alternatives, while also allowing more frequent monitoring and ultimately even self-testing at home. A company called BreathDX has been set up in order to further develop the project and explore commercial opportunities. The device is currently in production and will undergo clinical studies in May. Killard claims the technology could eventually be used to measure trace breath gases for other diseases, including potentially diabetes. Last week’s poll: Will a Brexit benefit UK manufacturers? Could this technology be used to help diabetics, particularly Type 1, to monitor blood glucose levels? I am aware of help dogs that are trained to respond to symptoms of a hypoglycemic attack coming on and part of that detection by the dog is the smell of the person’s breath. Anything to reduce, or completely stop, the need for many times a day finger pricking to get a drop of blood! Comments please. Hi Keith. According to Professor Killard, the technology does have the potential to measure trace breath gases associated with other diseases. He mentions diabetes specifically, but doesn’t elaborate on which type. Hi Keith, try the freestyle Libra, blood glucose testing patch. each one lasts for 2 weeks and automatically takes the blood reading via a monitor that you hold next to the patch. https://freestylediabetes.co.uk/our-products/freestyle-libre, its not available on the NHS yet I don’t think so is quite pricey, but worth it for not having to keep pricking your fingers! This will be a fantastic solution to all the Urea Cycle Disorder patients – including my daughter. The most Ammonia testing blood draws she’s had were 23 in 3 days (a third of which were down to failed attempts or bloods not getting to the Path Lab in the correct way – resulting in more needles). Hoping to attend the ‘Climb’ event in June to learn more. This would be a godsend for my son (Urea Cycle Disorder) we’ve always hoped for an ammonia check system at home especially since we are in a rural area. Hi Angela Climb are having a UCD event in June. It would be great if you can join us. You can find more on http://www.climb.org.uk where we will be keeping all families updated with new developments. This would be life changing for my daughter! Make it happen!! Can I buy this device now?